It is finally here! 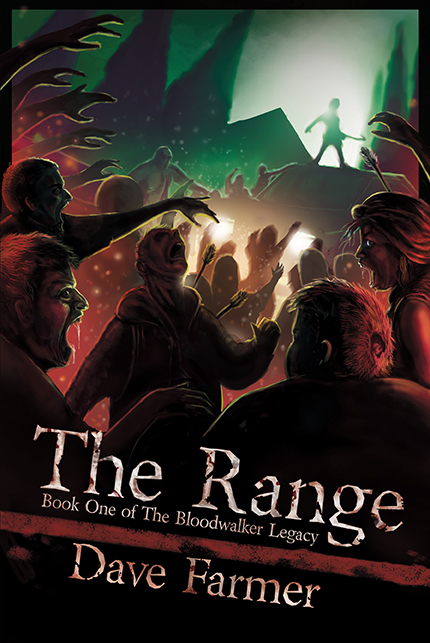 The new cover for The Range is finished. Before I get going I want to thank the amazingly talented artist, Jamie Noble Frier, who brought this to life. In summer 2015 I sketched a very crude drawing whilst sat on a beach of what I realised I wanted the cover to look like. The previous cover had been created by Christina Deubel, a wonderful artist indeed, and a fabulous piece of art. She’s amazing, so do check out her work. Both are stunning, though the new cover captures the essence of book and a pivotal scene crafted by Jamie from my really bad sketch. 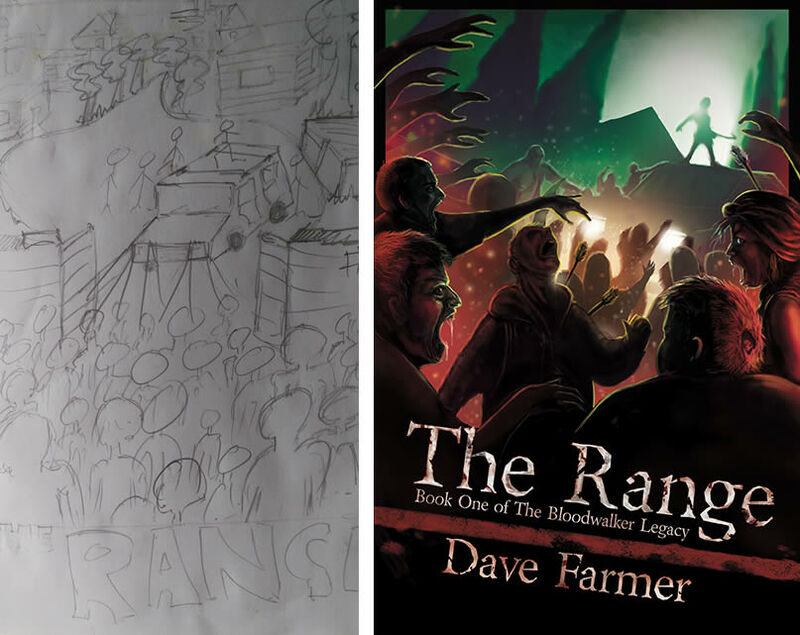 If you’re quick enough, and click this link – The Noble Artist – you’ll see Jamie is currently featuring the artwork for The Range on his website. If you’re looking for a book cover, or even to commission a piece of art, then go and check him out. His style is varied and the attention to detail is remarkable. I’ll be doing another piece on Jamie in the near future where I’ll be asking him about his art and creative process. As the author I guess I’m biased, but holy shitballs that’s a damn good cover! To give you an idea of how far it’s come from concept to finished piece, take a look at them side by side. Just to clarify, the one on the left is my mess of scribble, and the beautifully frightening one by Jamie is on the right. As the author (you know, the one who does all the words) I find it hard to describe how happy I am with the new cover. Jamie has a gift and no mistake. He kept me up to date with his progress sending me work in progress images as the piece evolved. He’s a great listener too, tweaking and adjusting bits and pieces after my suggestions or ideas. When I saw his initial rough sketch of what would become the final piece I just stared it and thought “Yes! That’s what I want!” I was amazed at how he had taken my pencil nonsense and an extract from my book and crafted something that linked directly to the scene I had imagined. It’s scary how it matches what I pictured when I wrote that scene. It’s the little details I like. The drool was an excellent surprise. The arrows too, shot by Pin into the crowds of infected. And the lighting. Oh man. That’s what caught my attention when first looking at Jamie’s website. He does light really well. It sure does capture that raw chaotic essence, one of a pitched battle where all hope has been shattered beyond repair. And it’s not just the front cover for ebook sales! Jamie worked on the spine and rear covers too for the print version. I can’t wait to get a new copy in the post. With this cover finished I feel I can continue on with the second book, The Holt, which had kinda ground to a halt recently. Not through lack of trying, but I’ve had lots of other stuff to do lately and finding time to sit and write has been tricky. I’ve got a number of posts around The Range – interview with Jamie, a new piece on my fundraising for the Kili expedition in Jan next year, training and stuff, and some more information on how I’m donating all sales of my book between now and January 2017 to the ZSEA Zoological Society of East Anglia. 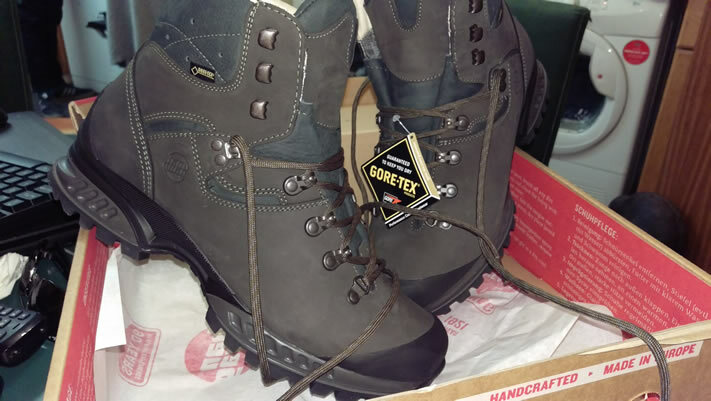 I’ve got my new boots too! Now I’m happy (grinning like a loon in all honesty) with the cover I’ll be doing some promotional stuff to drum up sales, an area I’ve put zero time or money into since the launch back in December 2014. Despite that I have had some good reviews on Amazon so far. So there are lots of fun things to come, dear blog reader, and with any luck The Holt will be launched by the end of the year! Today I am a happy fella! What’s just as amazing is that the Force Awakens come out on Monday! I’m so excited for you, Dave, and agree with you totally about how Jamie interprets so exactly the image that we authors see in our heads. It’s like he’s a mind reader. That’s a great pair of boots you’ve bought for your expedition. They look sturdy but nicely padded in all the right places. He is a mind reader! It’s spooky! I’m a tad irked that the kindle version has updated nicely, but the CreateSpace version has changed the cover but when you click Look Inside it still shows the old cover and the old interior text. I figure that’s why they say 3-5 days to sort out, but weird how one thing is changed and not the other. And oh the boots, so so comfy, and indeed fit snug in just the right places. Need to up the gym action now, increase the burn for the cardio and get the muscles working right! I’d chase up CreateSpace about the Look Inside updates, just to hurry them along or draw their attention to the fact, if it’s an oversight. And if you’ve opted for expanded distribution, you’ll find that the Barnes and Noble site will be way behind with updates. It still seems to have my book description from about 8 weeks ago, so heaven knows how long a new cover will take to update. There are always so many things to sort out. By the way, do you subscribe to Writers’ News (which is part of Writing Magazine), as they have two months worth of free advertising for subscribers on their Author Spotlight page? And you might be interested to know that I’m 15 pages off finishing my editing and formatting for the paperback version of my next book. I’ve done the formatting in such a way, that I can easily tweak it for the Kindle version without too much effort. It’s so much easier second time around. Good luck with your cardio and muscle work. You’ll have to take some “before” and “after” photos, so we can measure the results of your fitness regime! I sent an email to Amazon Author Team who have responded by saying I’d have to upload all the files in order to make a change. So they clearly missed the part in my email where I said I’d already done that! They did say they’d pass my email to the CreateSpace team. I’ve just sent them an email too. It’s weird how the cover has changed for the print version, but not the Look Inside cover or interior. I know I’ve done everything correctly. Frustrating indeed. By comparison I had problems updating the cover on Goodreads, so I sent an email on Sunday evening. To my surprise I had a reply in an hour, from an actual human! They explained my new cover would be made default but the old cover would be kept as an “alternative” so older readers can still find it. I thought that was pretty cool, and it was sorted in a couple of hours. Very impressed! 15 pages to go! Woop! Good for you! I feel my next one is languishing at the half way stage. Right now I barely have time to do little else than pop a couple of emails out each night before it’s time for bed. Even then I fall asleep with a book stuck to my face. Writers’ News, not head of it, I’ll check it out. Also, I learned you can get a free author profile on BookBub, regardless of whether you pay for their promotional advertising deals. It’s all a rich if sometimes frustrating learning experience! Just as well you chased up up about your book but, going on my experiences with the defective print copies, it might not be the first chasing up you’ll need to do. You might like to try https://www.iauthor.uk.com/ for a free author profile, too. They also do some fairly cheap advertising, although best to do it in conjunction with a Countdown Deal. I already have a profile on BookBub. Your second book is much longer than mine, that’s only 56K, as it’s primarily aimed at middle grade children, although I’m sure will be enjoyed by dog lovers of all ages! Well it all got sorted a lot quicker than I thought. I had an email back from Author Team who say they’d sent the original email to the CS Team. Reply the next day from them with technical stuff about uploading, blah blah, which I had already done. In short they adjusted the interior and cover for the Look Inside feature. I’m hoping to go full steam ahead with some promotional stuff in May, so thank you kindly for the links. Ah well, like the innuendo suggests it’s not the length that matters but what you do with it! I do enjoy a good dog story. Well written dogs make for good reading, so I’m looking forward to it! Glad it’s all sorted, and good luck with everything in May. Would you like to guest post on my blog and update people about your cover, your promotions, and about the donation of royalties from your book sales towards your amazing adventure next year? I think you’ll like my dog story. My feeling is that it’s going to be easier to market than Desiccation, although I’ve heard with children’s books that paperback sales are higher than Kindle sales, although there are lots of KNEP library downloads. That being said, I think my book is crossover fiction, so hopefully there will be some straight Kindle sales, too. Fingers crossed.